Winter is fast approaching, and for many of us that means frigid cold temperatures, snow, and dangerous ice. All around me I see neighbors battening down hatches to prepare for a long and dark few months. However, preparations aside from plastic window coverings often go forgotten. With the holidays just around the corner, many of us have family on our minds, and it personally has me worried about slip prevention, especially for our youngest and oldest members. Solutions to combat slipping can be time consuming as well as expensive; luckily, there are many simple preventive measures that can be taken to ease this worry. In my opinion, the simplest preventative measure is a drain thru mat for each of your entryways — and don’t forget your garage entrance after all of that snow shoveling! Our Olympian series drain thru mats are 100% recycled material made from trim rubber used in tire manufacturing. 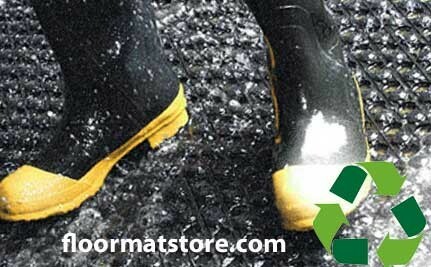 These mats are built to withstand the most extreme conditions. 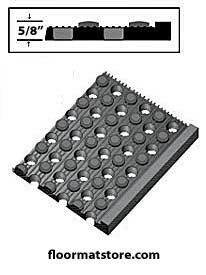 While other drain thru mats will crack and fall apart with the cold, these will last and last and last. Olympian mats show no visible cracks or fractures in temperatures as low as -45 degrees Fahrenheit! Then when the spring and summer months come, there is no need for them to be replaced, as our Olympian series shows no signs of deterioration at even 400 degrees Fahrenheit! Whether it’s hot or cold, this mat is built to take it! We are already late in the year, and while most slip prevention projects require tedious installation and warmer temperature for adhesives to adhere, this mat is heavy enough to simply be laid out, while still being light enough to hang dry when needed. This entry was posted in floor mats, Floormatstore.com, safety tips and tagged drain thru mats, entrance mats, floor mats, rubber mats on November 27, 2017 by Derick.